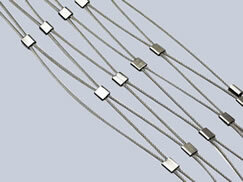 Cable mesh, made of high quality stainless steel, is a fabric of particular resilience and flexibility. Invented in 2000, it opens up a new world of spatial possibility using cables. And not doubt, it sweeps across the global market quickly thanks to its high strength, durability as well as corrosion resistance. Boegger, as one of the leading manufacturers of cable mesh in the Asia, provides various cable mesh mainly in three styles: knotted cable mesh, ferrule type cable mesh and square cable mesh as shown in the right picture. Both knotted and ferrule type cable mesh feature rhombic patterns, but they are different in the combination way of cables. The cables of former one are inter-woven together, in contrast, the latter one gets its name for seamless ferrules for combining. As to square cable mesh, no less than six types can be supplied by our company to suit different needs of your projects. Normally, the knotted type and clamp type in the right picture are more welcomed by our customers. Our range of cable meshes are manufactured from high tensile stainless steel AISI 304, 304L, 316 or 316L. Meanwhile, these cables are available in constructions of 7 × 7, 7 × 19 or 1 × 19 and in diameter from 1mm to 4mm. Other specifications can also be manufactured to match your design requirement. What can stainless steel cable mesh do for you? 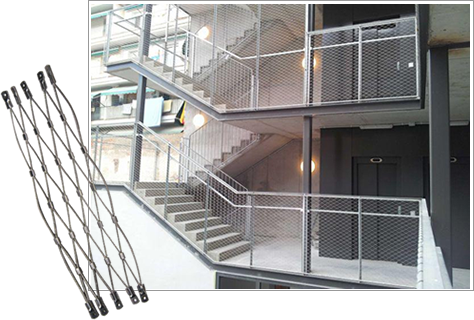 Stainless steel mesh balustrade for bridge, stairs and paths. 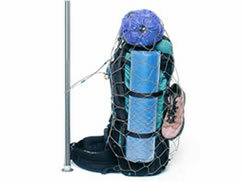 With high strength and impact resistance, these meshes effectively minimize potential fall accidents. Ideal to be used as building facades and green walls to encourage growth of climbing plants and generally seen in parking garages and urban greenways, etc. 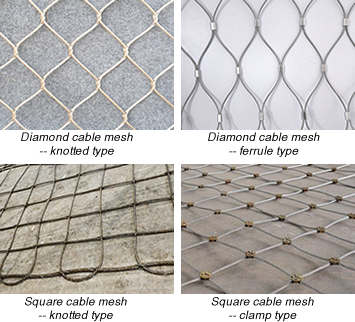 Also known as zoo mesh and aviary netting, stainless steel cable mesh is perfect for animal and bird enclosure as it is flat and flexible to prevent impact damages. Stainless steel cable mesh is also used as a garden fences, safety fence in stadium, partition fence and safety net that prevents suicide to the largest extent. Using high quality stainless steel material with high strength and toughness. Flexible stainless steel structure, high impact resistance and load capacity. 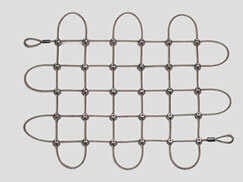 Superb corrosion resistance made these cable mesh ideal to be used in the harshest condition. 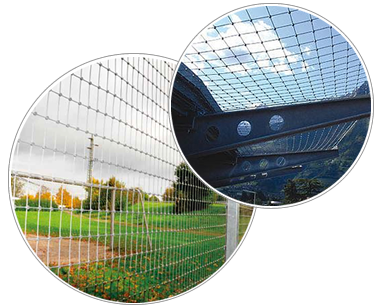 Our cable mesh can be used for years owing to its great environment resistance. Competitive price, low even no maintenance and long life span allows for high cost effectiveness. Boegger stainless steel cable mesh is easy to install, dismantle as well as re-install. If your are interest in our products or want learn more about its specifications, material and prices, please email us directly at flegal@cable-mesh.com. We are more than happy to answering your questions. Ferrule type stainless steel cable meshes with high strength are intended for animal enclosure, balustrade, safety fences and ceiling, etc. 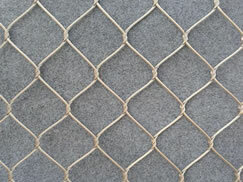 Stainless steel knotted cable mesh is a rhombus mesh with high flexibility, toughness and ideal for balustrade, zoo enclosure and facade greenery. We supply galvanized and stainless steel square cable mesh that functions well in facility protection, decoration and slope stabilization, etc. Anti-theft backpack protector, made of stainless steel, is the best choice for protecting your bags from being tampered with, pilfered and stolen. A simple introduction about different types of stainless steel and their different properties determine the working environments of cable mesh. Our company manufactures a wide range of vertical and horizontal stainless steel cable mesh with various perimeter styles. A guidance about how to assemble stainless steel cable mesh to the tubular frame to form a balustrade mesh infill panel.